Now that we are in the thick of school, let’s talk homework!!! I love homework! I live for homework! Homework is, in fact, my favorite! 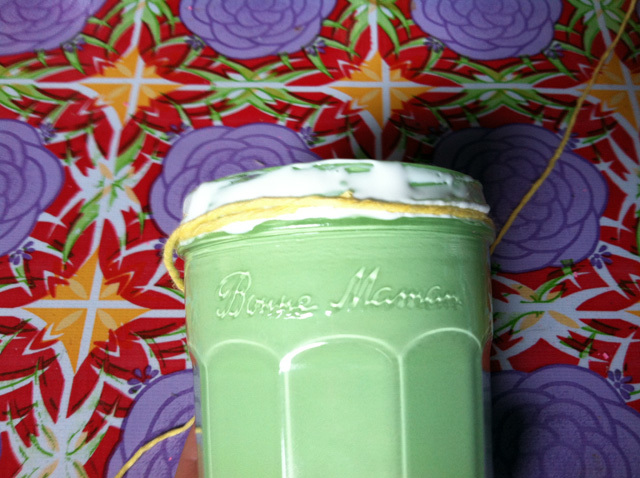 The object of this project, was not to make my snug like homework more, but to establish a good homework routine. 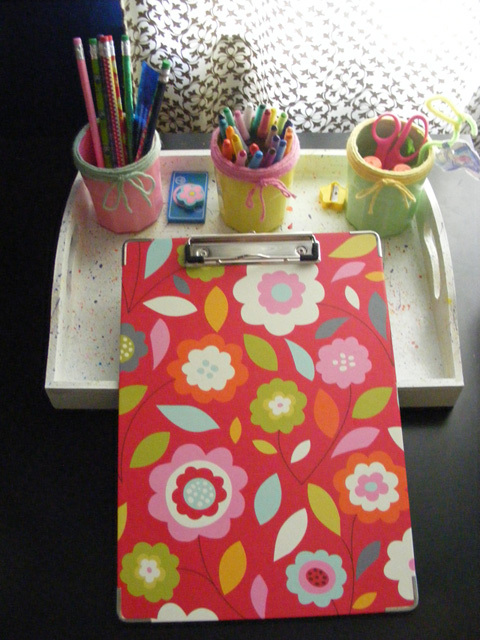 This tray makes it easy to do homework anywhere after school. Nice day? Let’s do homework outside! Tried? Let’s do homework in the bedroom. Any old day? Let’s do homework on the dinning room table. 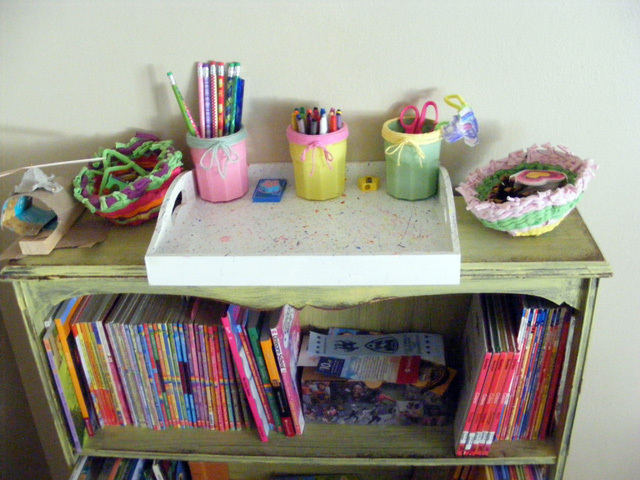 The point is, anywhere you do homework, with the tray all your supplies are at hand. Closer supplies = less stopping = less distractions = more play time!! 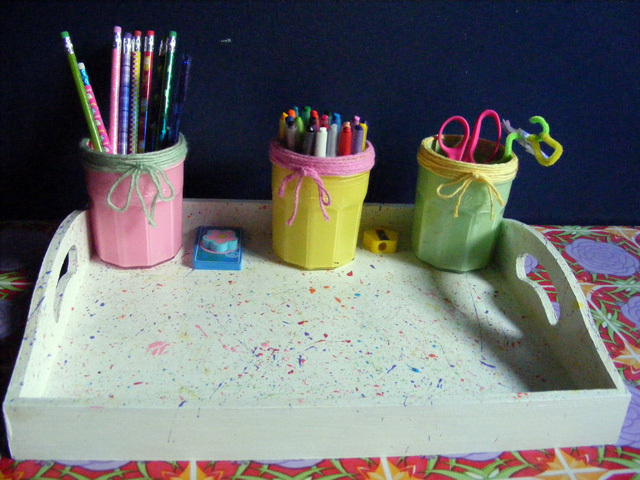 You will need a variety of things to make this exact tray, though I have seen many versions on the internet. 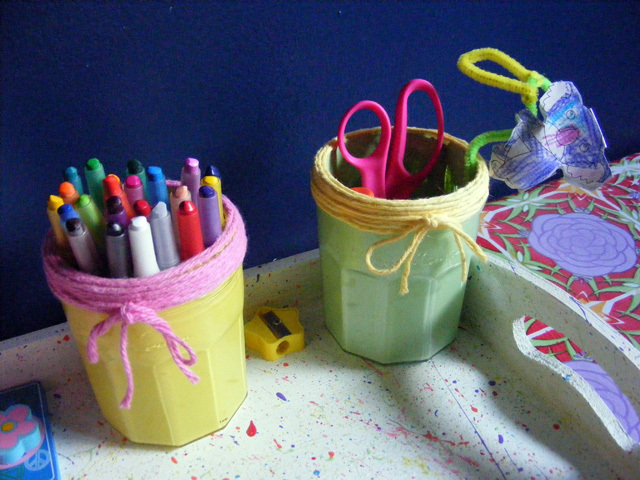 For this you need: a tray, paint, modpodge, paint brushes, yarn, old jars, a clipboard, and any school supplies you deem necessary. 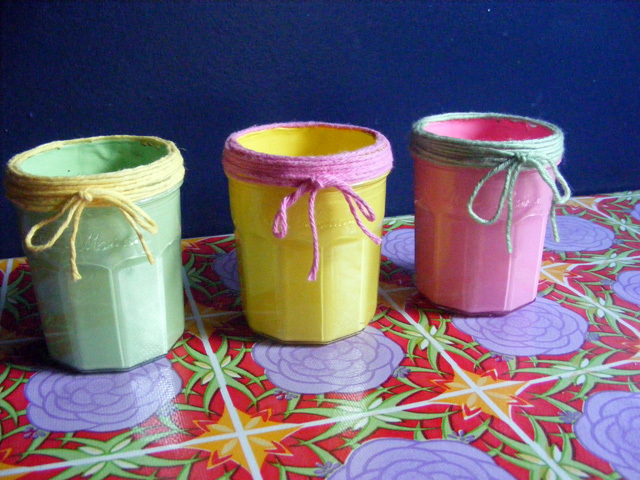 We used some old store-bought jelly jars we had in my giant stash of things I can’t yet recycle because I want to up-cycle. 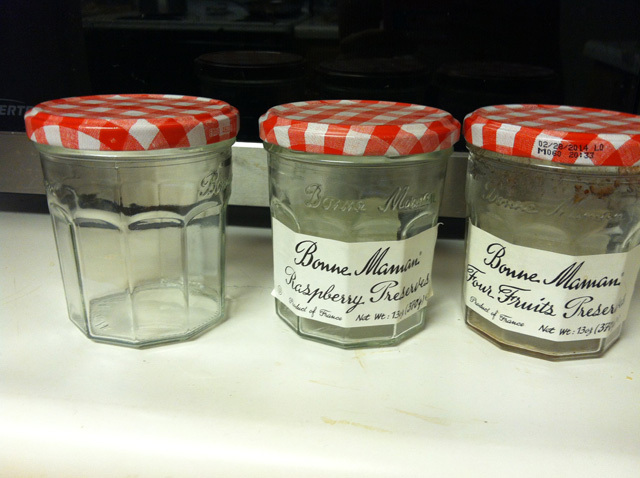 First really clean the jars. The inside will be painted, so it needs to be spotless. A nice warm bath with Dawn dish soap does wonders to those labels. 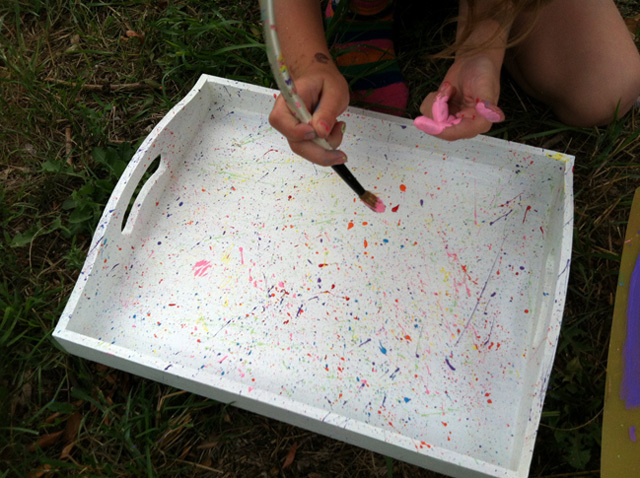 While the jars are washing, or soaking, you can paint your tray! The snug has been super into Lalaloopsey recently. 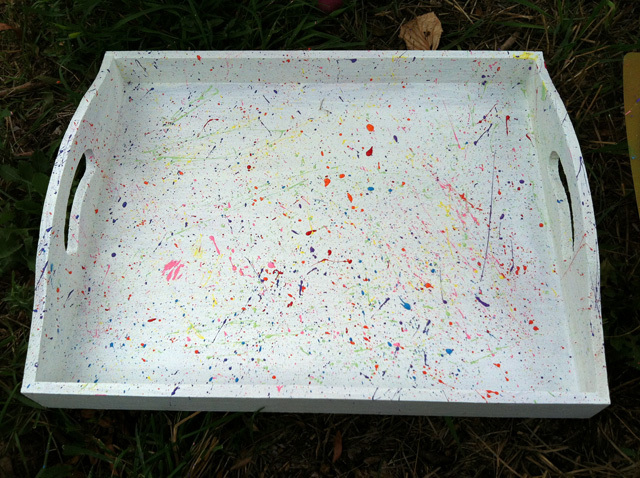 So she wanted an artsy tray, like Spot Splatter n’ Splash’s dress. 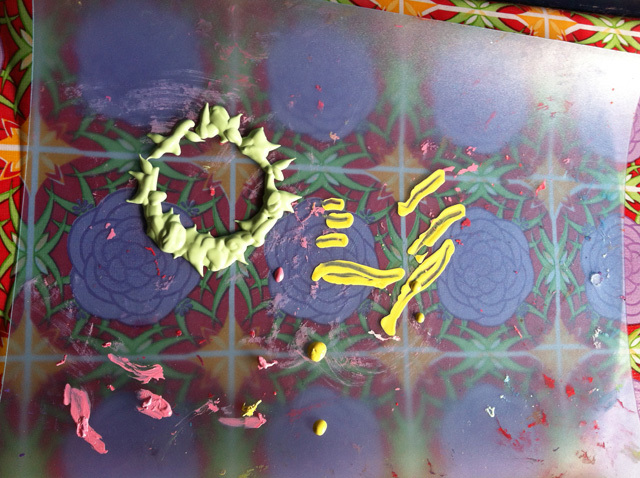 For that look, paint the tray white and then using a good amount of paint on your brush, brush down your finger fast, towards the tray, to splatter the paint. It makes a big mess, so is best done outside. It turned out very cool. Good idea snug! 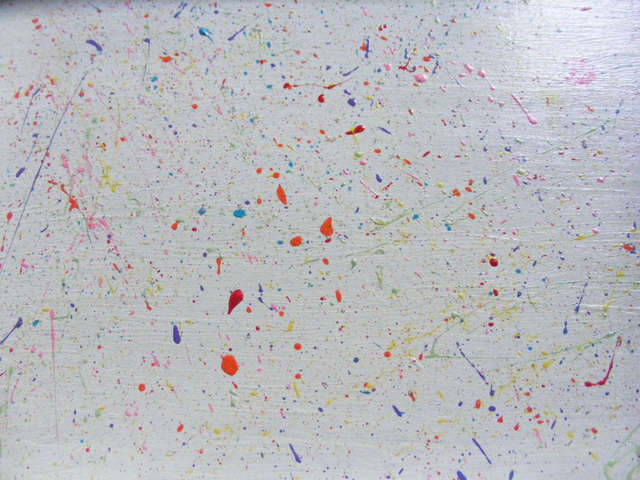 Since we did the splatter look, I put a good coat of modpodge on the tray, after it was dry. So the paint wouldn’t fleck off. Your tray is now finished! 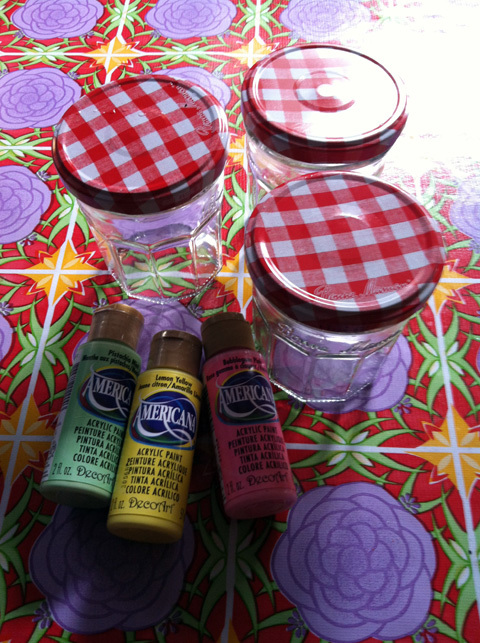 Back to those jars. 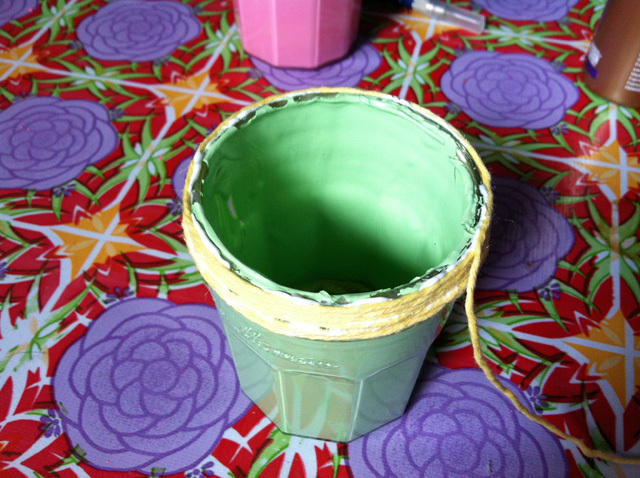 Once they are dry, grab a good amount of the paint you want to use to coat the inside. 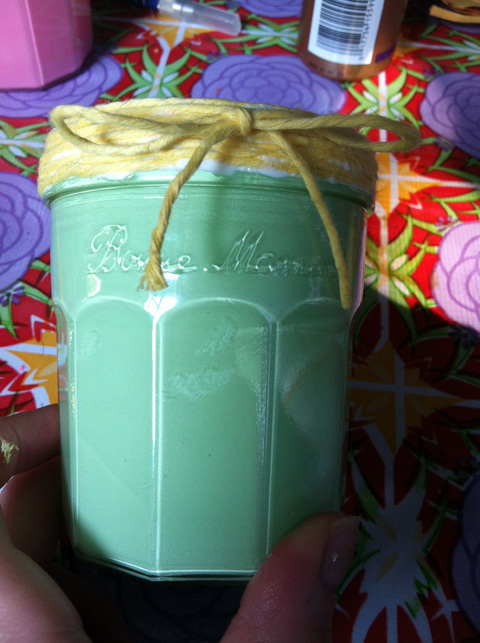 This was my first time painting the inside of a jar, so I didn’t take too many pictures. 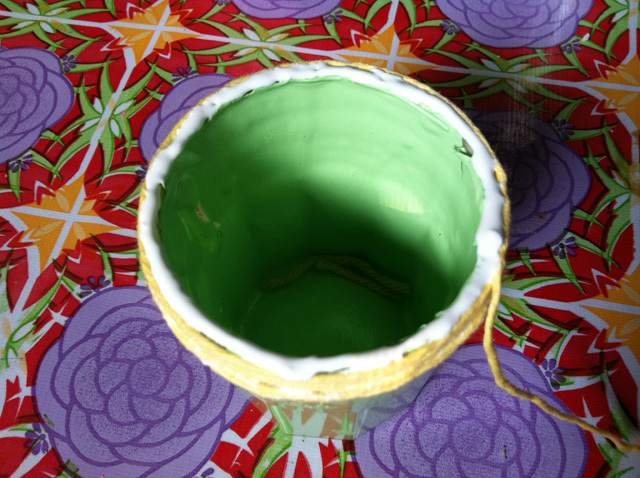 I squeezed a lot of paint into the bottom and slowly moved it around, then I did the same for the sides. Squeeze on the sides and move it around. 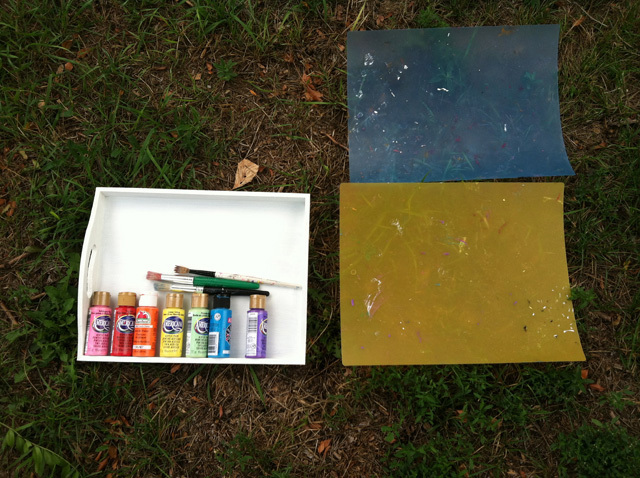 I had them rest upside-down on a wire drying rack with a painting placement underneath. These take a long time to dry. 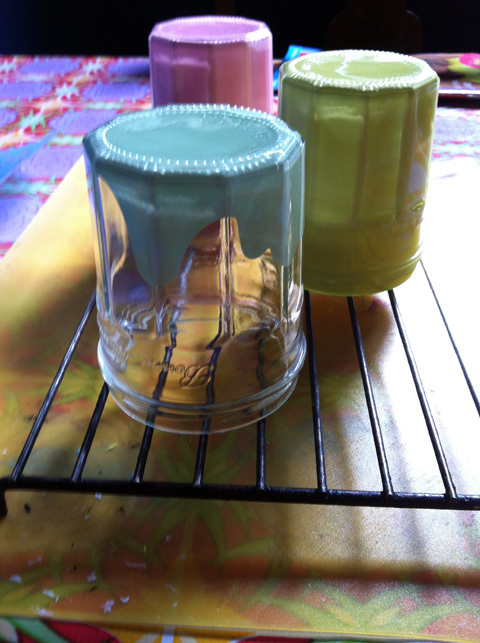 While they are drying, you might want to move the drying rack and scoop up all of the dripped paint. No need to waste it. 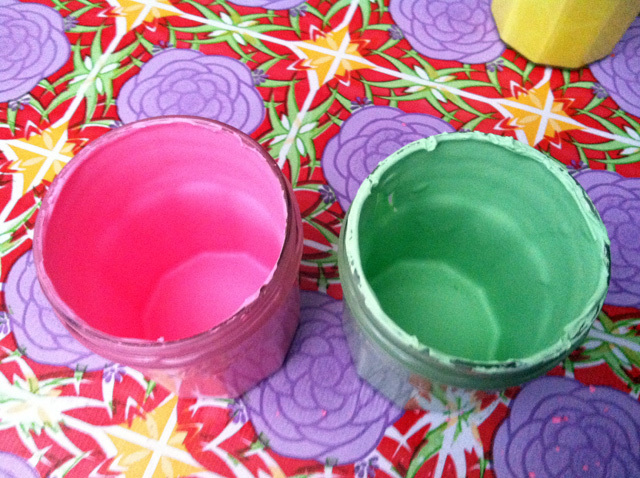 Once they are dry, scrap the excess dried paint off of the edges. 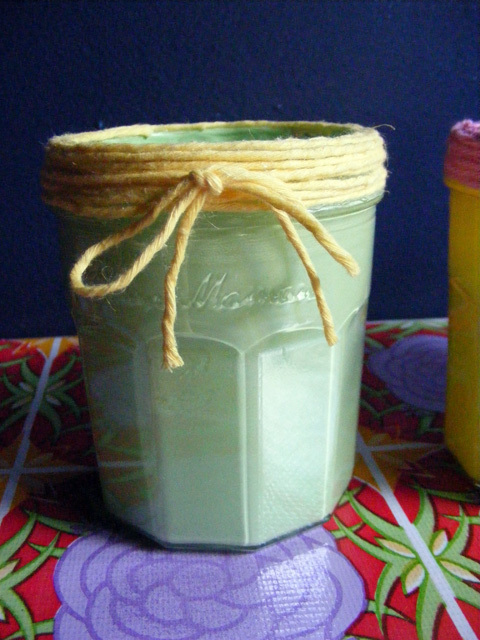 I then did some touch ups with a small paintbrush and finished the inside with a coat of mod-podge. 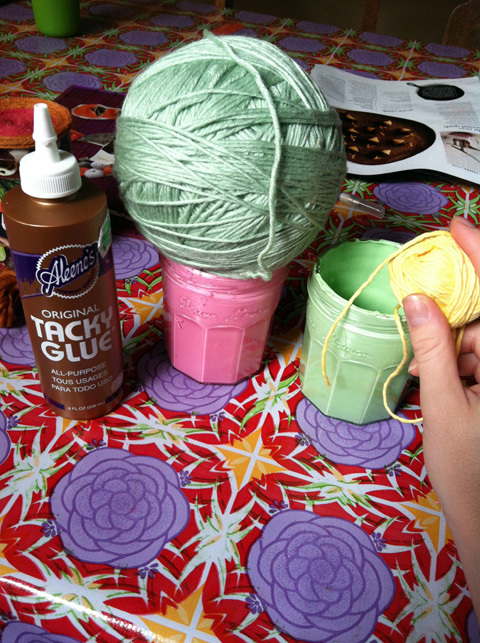 After that grab your yarn and tacky glue!! Start gluing and wrapping. Once you are started it is easy to get the yarn good and tight. I glued my end piece down and then with an extra piece of yarn, I wrapped it around the middle and tied a bow! Wonderful!! All done! Now grab the tray and accessorize!!! 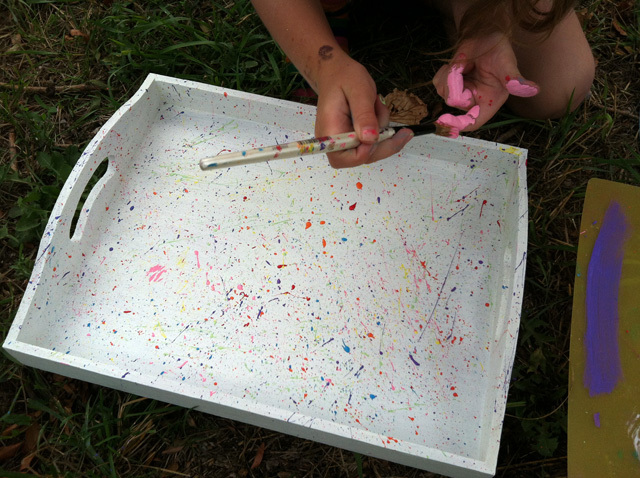 We also picked up a clipboard for our tray, just in case we ever do homework outside. 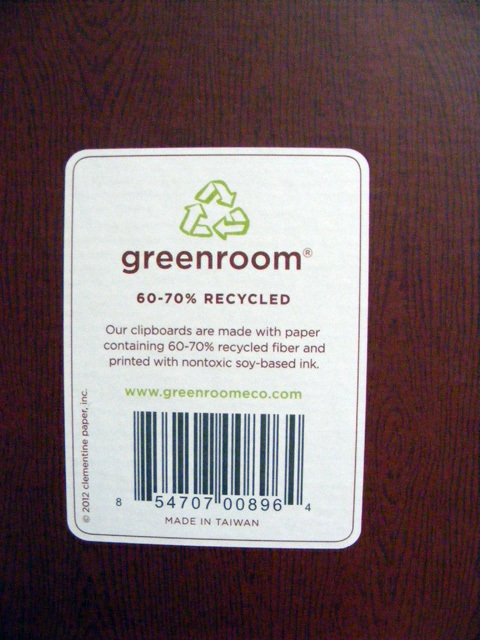 The clip board was mostly eco-friendly, of course!! Now, last and most important. Find a good place out in the open where the homework try will be accessible every afternoon!! !